How has convergent evolution helped the North American Cacti of the Cactaceae Family and the African Euphorbias of the Euphorbiaceae Family to adapt to desert environments? The North American Cactus and African Euphorbia species originated from two different, but similar plants. These plants were the typical herbaceous species of the early Earth, characterised by their slim stems and large, wide leaves. However, their evolutionary paths began to change with the separation of the early supercontinents, Pangaea and Gondwana. As variations in the climate caused the development of harsh, arid, desert environments, both plant families experienced convergent evolution in order to adapt and survive. Cacti and Euphorbias both converged on similar forms and metabolisms after prolonged exposure to corresponding environments, due to the fact that similar biomes can require the same adaptations. A common characteristic which has developed for both plant species, as a result of convergent evolution, is the adaptation of branching stems and longitudinal ribs. In order to contend with the harsh desert environments, the African Euphorbias and North American Cacti had to somehow adjust to the climate. One of the adjustments that were induced was the evolution of branching stems covered in longitudinal ribs. This is especially evident in the Peniocereus Striatus (also known as 'Cordoncillo, the 'Gearstem cactus' or 'Dahlia-rooted cactus') Cactaceae species of Arizona and the Sonora Desert, and the Euphorbia Cryptospinosa, a Euphorbiaceae species of East Africa. Both species, although unrelated, have developed slender, succulent, branching stems covered in longitudinal ribs. These ribs are able to contract in periods of very hot weather or climate, acting as shield in order to protect the stomata (pores in the plant leaf – serves as the site for gas exchange) hidden deep within the cactus or euphorbia furrows. This is especially efficient in desert environments because the plant is able to protect its pores, conserve water and regulate gas exchange. Euphorbias and cacti began their evolutionary paths with large wide leaves. However this was inefficient as in the desert, a plant loses most of its water through its leaves. In order to contend with this, the North American Cacti and African Euphorbias had to adapt to counteract their susceptibility to evaporation through leaves. Smaller leaves lost less water so through the process of convergent evolution, leaves began to reduce in size and became stiffer, until they evolved into the stiff, spines that are present today. In the Peniocereus Striatus Cactus species of Arizona and the Euphorbia Cryptospinosa Euphorbia species of East Africa, the short spines help the plant to restrict airflow and water loss. Spines provide a shade cover for the physical ‘valleys’ in which stomata are located, serving to minimise the effects of evaporative water loss and a form of protection from UV isolation. Moisture can condense between the spines, therefore allowing the plant to harvest water, even in periods of no rainfall. The spines function as a countermeasure and a form of physical protection from threats, such as wild animals. Some spines also provide opportunities for reproduction and re-seeding through transfer by passing animals. For example, the curved spines of the Ferocactus Wislizeni (also known as the Fishhook Barrel Cactus), are designed to attach to the skin or fur of a passing organism, and transport the plant to a new location in hopes of increased productivity if the plant is susceptible to threats in its current location. 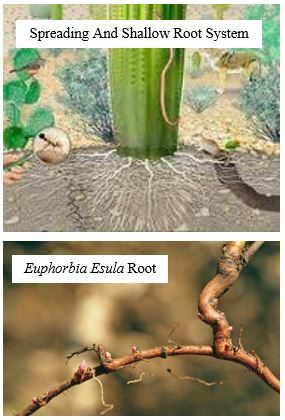 Euphorbias and cacti evolved from their tropical ancestors to develop a spreading, shallow, fibrous root system, through convergent evolution. Both plant species have extensive root systems, located just beneath the soil surface. This is an adaptation for drought tolerance as cacti and euphorbias can absorb varied amounts of water or moisture from the soil surface, during times of light showers or rain. Shallow roots also allow for easy transportation to a better environment. For example, the roots of the Ferocactus Wislizeni (also known as the Fishhook Barrel Cactus) are designed to be easily removable from soil if the soil quality is too dry. This ensures that the plant can be transported via animals (skin and fur) to an environment where soil quality is increased and there is the necessary moisture for the roots to settle. Euphorbias and cacti evolved to reduce and minimise water loss due to the hot and arid climates of the desert biome. Their water storage systems had to be improved, so both plant species converged and developed succulent water reservoirs in their stems. The stems expanded becoming larger in size and extensive water storage tissues formed in the pith or cortex. Therefore, euphorbias and cacti could store water in their stems, preventing water wastage and sustaining the plant. The development of folded or ‘plicated’, succulent stems in cacti and euphorbias also contributed to their efficient water storage practices. Folds in stems allowed for stem expansion during rapid water intake after precipitation and contraction of the stem during periods of drought. This is evident in the Carnagiea Gigantea (also known as the ‘Giant Saguro’) of Mexico and some Euphorbiaceae species in Africa, with their notable large, branched stems, folded into longitudinal ribs – ideal for water storage. The North American Cacti and African Euphorbias converged by developing a photosynthetic mechanism called ‘Crassulacean Acid Metabolism’ or CAM. Crassulacean Acid Metabolism photosynthesis is a process in which euphorbias and cacti can conserve water by the opening of the stomata (a plant’s pores) and the implementation of the fixing of CO2 or carbon dioxide intake, primarily at night. This process can occur with the Rhodocactus and Pereskia species of Cactaceae, as well as the Euphorbia species of Euphorbiaceae. CAM plants intake carbon dioxide during the night through stomata. During the daytime, the stomata close, enabling the stored carbon dioxide to be utilised for photosynthesis. Crassulacean Acid Metabolism is a very effective adaptation for euphorbias and cacti because desert plants that thrive in arid environments are especially susceptible to desiccation. CAM photosynthesis gives plants the opportunity to close the stomata during the day, ensuring that plants don’t lose water through evaporation from the sun and wind.